This thriving community sits on the east coast of the north Highlands that runs from the Moray Firth up to Sutherland. It is blessed with a particularly sunny climate thanks to its sheltered position, and has miles of golden sand beaches. 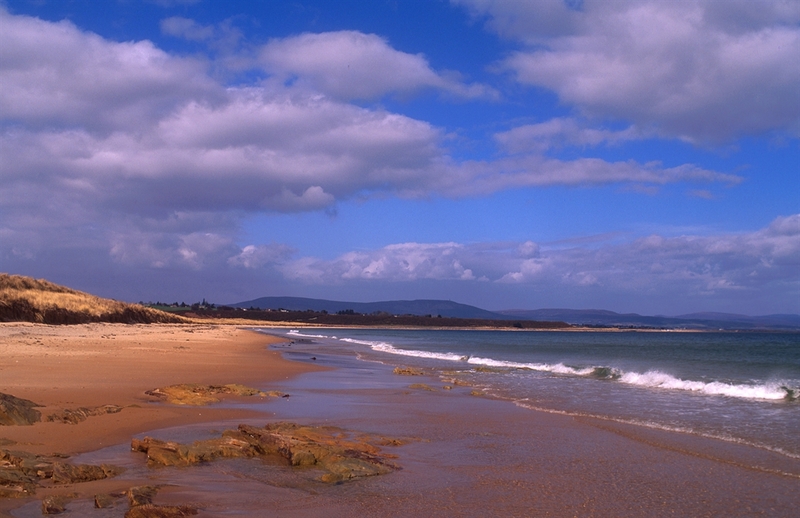 The beach stretches from Dornoch Point heading past Embo beach to the mouth of Loch Fleet National Nature Reserve. Adjacent to the beach is a Site of Special Scientific Interest that features nesting birds, flora and fauna. And for those keen golfers, tee-off on the Royal Dornoch championship course, ranked 13th in the world.! The coast is also a favourite with wildlife such as seals and a sizeable population of both breeding and wintering birds. The town is famed for its impressive cathedral. Founded in 1224, it was restored by the Countess of Sutherland in 1835, and again in 20th century. Scotland’s top philanthropist Andrew Carnegie paid for some of its stained-windows. The town is also reputedly where the last witch in Scotland was burnt in 1722 - a fact commemorated by the Witch’s Stone. VisitScotland / Paul Tomkins, all rights reserved LOOKING ALONG THE EMPTY BEACH OF DORNOCH SANDS- AN EXTENSIVE SANDY AREA ON THE NORTH COAST OF THE DORNOCH FIRTH, SOUTH WEST OF DORNOCH, SUTHERLAND REG VisitScotland / Paul Tomkins, all rights reserved LOOKING ALONG THE EMPTY BEACH OF DORNOCH SANDS- AN EXTENSIVE SANDY AREA ON THE NORTH COAST OF THE DORNOCH FIRTH, SOUTH WEST OF DORNOCH, SUTHERLAND REG VisitScotland / Paul Tomkins, all rights reserved LOOKING ALONG THE DORNOCH FIRTH FROM STRUIE TOWARDS BONAR BRIDGE, THE VIEW THAT IS KNOWN AS THE "MILLION DOLLAR VIEW", HIGHLAND. VisitScotland, all rights reserved. Dornoch Firth, the Highlands.